The upcoming election offers some very bright and dark scenarios to consider for investors, so it seemed prudent as we are about to launch our Website that we submit our first contribution from the staff at StockMarketSquawk with some timely insight and opinion. There has been meaningful influence over the benchmark indicators as of late with equity futures rising and falling with every swing in the polls. While trading in a tight range for the last couple of months, it seemed Hillary Clinton was on her way to victory and the markets held onto yearly gains, but as the case yesterday with Trump getting a strong showing in the latest Post/ABC polling, markets fell quite abruptly. Let's get the ugly scenario out of the way first. Markets do not like uncertainty, and a possible Trump victory redefines this condition in almost every way imaginable. An outsider, whose unscripted, shoot from the hip comments challenge almost every individual and institution out there while at the same time promising a return to greatness makes it hard to forecast what's coming next. If this isn't enough to make an interest rate fragile market jittery, his business acumen is frequently questioned and his lack of transparency in his own state of affairs makes it near impossible to even guess how this translates to managing the free trade world and the many volatile personalities that come in the mix. Most telling from a viewer standpoint, is who "does" he get along with? He claims he can and has dealt on both sides of the aisle, but so far this year it appears he's enormously capable of insulting quite a large variety of people from world leaders, war heroes and foreign nationalities all the way down to beauty pageant contestants and handicap people. In this regard it's hard to imagine peaceful and fair minded negotiations in trade and geopolitical talks. Short term support levels were broken in the last couple of sessions and for the moment it looks as though we are on our way to test the 200 day moving average for the major indexes. This "Trump factor" uncertainty has appeared to have given the green light for investors to self-deport themselves from equities. Recent withdrawal statistics from mutual funds underscore this trend. Medium term stock market patterns indicate that a correction may have begun and post-election this is just the sort of fuel to the fire scenario that could drive this market to wipe out the year's gains and enter bear market correction territory. Alternatively, a Clinton victory is not necessarily the catalyst to keep markets afloat. She has her own demons to battle with and if by chance she wins, but a criminal investigation gains momentum, this also casts the uncertainty shadow over the markets. Add to that, rising healthcare costs and the entire disappointment of this challenged industry from mainstream America doesn't necessarily bode well for her and her abilities considering past attempts to fix the system. However don't fret, regardless of who wins, this push downwards is very healthy for the market and with a potential December interest rate hike looming, as far as Washington DC is concerned for the markets, take a breather, sit this one out for the next few weeks, let the rate rise come, then may be the time to be fully invested again after the dust settles. What this article is really about are the election issues on state ballots and the potential impact for a couple particular industries with a couple stock mentions. These opportunities we see that are developing looking out the next few years are very compelling for long term growth. From the website Ballotpedia, here are the important issues affecting a few industries, the general population and economic measures in various states. Tax increases on tobacco, tighter gun control regulations, exemptions and allocation collectively affecting over 200 million people are on some state ballots. 5 states have votes on healthcare issues, varying from medical equipment tax emptions to drug pricing, dental plan taxation and most notable, Colorado's creation of the nation's first single payer, healthcare system. 5 states have minimum wage increases proposed affecting over 20 million people. 9 states, potentially impacting over 80 million residents, will be considering legalization initiatives in the voting booths. After all is tallied and levied, a few industries in focus on these ballots will be in the Healthcare, Tobacco and Marijuana business. Of the three, it would behoove some investors to look at the medical device industry with curiosity, be wary of the tobacco industry, and have wide open eyes on the impact to the Marijuana industry. The latter potentially being the greatest growth opportunity to come along outside of tech and energy in a long time. A longtime favorite of ours in the medical device industry worth being curious about. Nevada is proposing to exempt from sales and use tax durable medical equipment including oxygen delivery equipment and mobility enhancing equipment prescribed by a licensed healthcare provider. The measure came forth as a result of increasing copays that are crippling families' finances in the state and is even worse for non-insured where the sales tax can reach into the thousands of dollars for severely disabled patients. Nevada lawmakers consider this a win for all as they feel it would have very little impact to state tax revenue but have a significant impact for the patients and their families. Look for other states to eventually be friendly to this type of tax policy considering there are much more important issues affecting increases in healthcare costs for the everyday citizen. It is not a reflection of this segment of the industry. While not materially impacted by this tax proposal, one device maker that has always been a consistent performer that may benefit from this tax trend longer term would be ("Medtronic(MDT)"). The company has had some challenges lately with some product recalls and some device deficiencies leading some institutions to scale back their positions in recent 13F filings, but the stock is very attractive around these levels. After running up nearly 30 percent earlier this year, it has given up about half those gains along with the general market retracement the last few months. 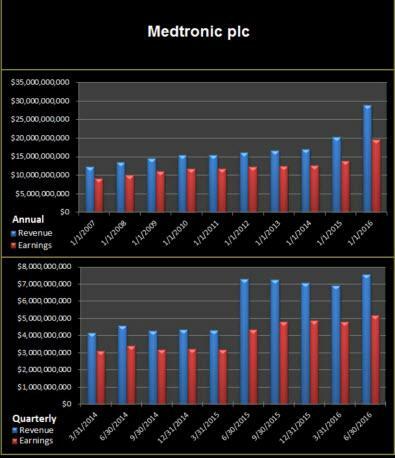 As evident in the Sales and Earnings Growth chart attached, Medtronic has had an outstanding year. 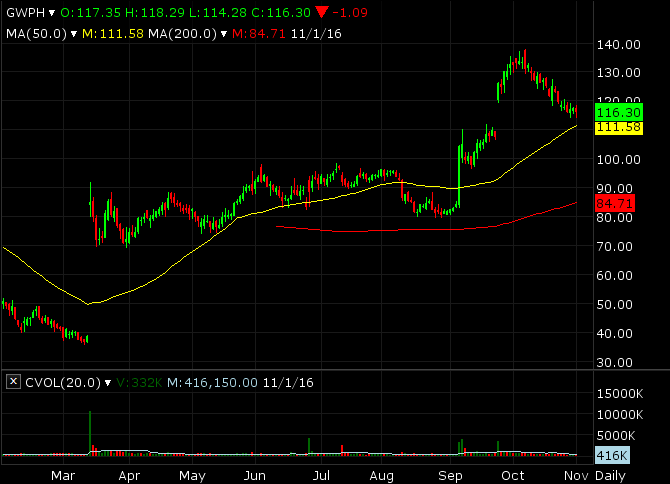 Despite nice growth the stock has not been immune to recent weakness however we love stock retracements!! The stock has pulled back to a nice entry range sitting on its 200 day moving average and with any general market pullback, the mid to high 70s makes this a screaming candidate for anyone's portfolio long term. 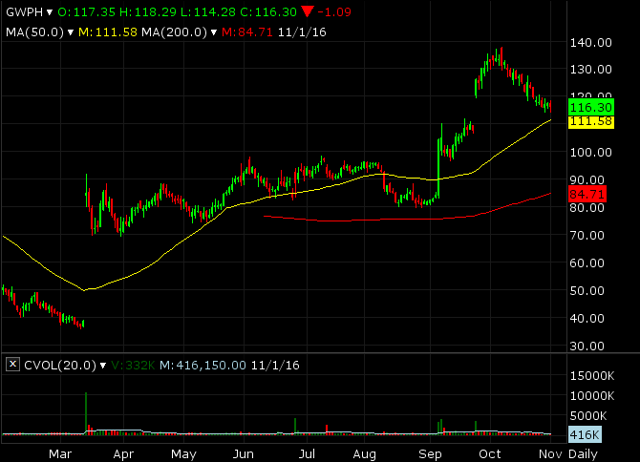 They also provides a nice 2% yield for income investors looking for a little medical juice on top of future growth. Next up is the ever increasing trend towards marijuana legalization. Make no mistake , some very large players have been positioning themselves to take advantage of this trend. Some speculation of late is the blockbuster Bayer-Monsanto arrangement that has some speculating that both are maneuvering themselves to collaborate on GMO cannabis technologies. Rumors of a George Soros led venture in Uruguay and his huge position in Monsanto may lend creed to this theory. George is a market mover and shaker and many times it's well worth following his lead. Regardless of his endeavor, Bayer has already been heavily involved in various therapies, products and technologies surrounding cannabis. The Monsanto deal was a brilliant move for long term growth, distribution, and collaboration. We choose to highlight one stock that has been making great moves and is well positioned to continue rapid growth in a fast uprising industry of medical based cannabis treatments. British biopharmaceutical company ("GW Pharmaceuticals(GWPH)"), was given FDA fast track orphan status approval earlier this year for their marijuana based medical treatment for children with epilepsy. The company was also the first company ever to be granted approval for a cannabis product Sativex, a plant derivative used to treat infants with multiple sclerosis. Besides being a major breakthrough in FDA consideration for "any" marijuana based treatment in itself, it has now paved the way for many other potential therapies and treatments for many different ailments and conditions that allowed for medical marijuana to graduate to a current form of acceptance universally around the world by top medical practitioners. GW Pharmaceuticals had a previous partnership with Bayer for the distribution of Sativex and based on recent buyout speculation sending the stock higher in September, it appears that this could be one of the great pioneering growth stories for the Marijuana business in general moving forward. We like this stock at current levels but any market opullback is worth waiting for to grab this in the $105-110 range on any break below it's 50 day moving average. Look for support in the low $100s on any general market selloff and that would be the ideal entry level. Investors however please beware of the many small cap marijuana stocks that have been heavily traded in the last few months. While we see this industry exploding, many of these companies are highly diluted with little or no revenue and earnings to justify their stock values. It is much better to stay with well recognized names in this business that have demonstrated long track records of development and research and have made all the right connections in the medical space. Also be aware that large players such as the Bayers and Monsantos of the world will gobble up small players as they always have in the past to corner themselves in these markets. Are we endorsing these other companies also as good investments? You bet we are!!! Seed manufacturers, agricultural companies of many sizes and shapes are sure to benefit greatly here and abroad in this industry as trends stay to the upside. Even some of the fertilizer companies such as SMG, and equipment suppliers as well other biotech firms are some the best growth opportunities to come along and the pending ballot initiatives in 9 nine states from coast to coast should not be overlooked looking out 3-5 years.